Have you been to Old Towne Orange this weekend? 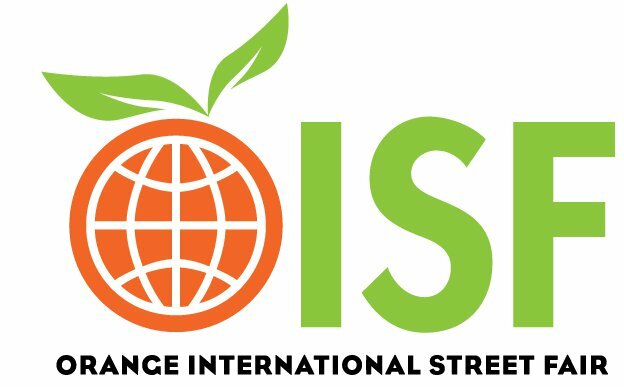 It's not too late to go check out the Orange International Street Fair that is going on until 10pm on Sunday. I just went this morning after my friend told me about it; curiosity got the best of me considering I hadn't heard of the event before but it had been around for a while. There were a lot of tents set up along the streets with lots of different types of food. As for the traffic circle itself, sponsors and small merchants had their own tents selling items like jewelry, tin signs, bags, and more. It was quite the sight but nothing fancy, just plain and simple. I enjoyed it but probably wouldn't drop by every day. My friend and I decided that to prevent us from impulse food buying (we went on empty stomachs, har har), we would walk around all the vendors first to see what was offered and for what prices. We had saved money on parking by snagging a spot in Chapman University's parking structure and were ready to blow our cash on delicious food. Surprisingly there weren't any options for vegetarians who wanted to get full on a single entree. Sure there were side dishes but nothing hefty. That was a disappointment as my friend is near-vegetarian. The food was decently priced at most places for fair food though. The first place that took our money sold Norwegian cookies. They were pretty cool looking in shape but honestly not what we were expecting. It made me reconsider what is considered a cookie. The batter itself was similar to wonton so the entire cookie tasted like fried wonton wrapper. We thought that it would be doughy but it was hollow on the back. If you want to have some powdered sugar coated fried wonton wrapper, give that one a try. My own pick for filling food was a naked banger. That would be the Irish term for their sausage. I thought it was great, and I realized that it would be my second time of eating Irish food in 3 days' time. The sausage casing was fabulous and the grilled veggies had a nice tangy sauce to them as well. I thoroughly enjoyed the $5 I spent on it. Because there wasn't any vegetarian food, my friend and I walked to Bruxie for her to get breakfast/lunch. Before that, we got some homemade Greek pastries (kataifi, trigona, baklava, and galactobouriko). They were actually way too sweet except for the last named one because it had a lot of custard. We didn't finish off our pastries in the end and had to leave them to the dumpster. The honey was overpowering, and the pastries themselves were too thick. Good try though, Greek vendor.